The Roldan family and care team. JourneyCare has a long-standing commitment to provide outstanding care for the whole person – body, mind and spirit – and for caring for the family as well as the patient through the course of serious illness and beyond. In addition, JourneyCare is committed to making sure that all patients and families receive the same high level of care, regardless of ability to pay. To meet these goals, JourneyCare created the Comfort and Joy program to provide patients and families under our care with special non-medical needs and desires that can arise at this most difficult and vulnerable time. Comfort and Joy’s support of JourneyCare patients and families is wide ranging; it may include giving a patient and family an opportunity to enjoy life’s little joys by fulfilling a special wish, or providing assistance with day-to-day needs or emergencies. For example, in recent months the program has provided an air conditioner for a patient’s home during extreme summer heat, secured equipment such as special chairs fitted for pediatric patients, and secured winter coats for a patient’s school-age siblings. The Comfort and Joy program has also helped patients fulfill a special wish, such as making sure a family member would receive a birthday cake and remembrance from the patient. One mom – whose daughter loved long bike rides – asked for a tandem bike so she could peddle her daughter around the neighborhood. 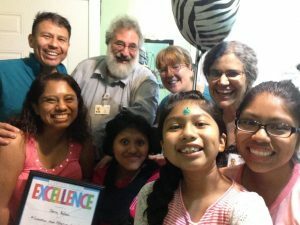 Or, as in the case of the Roldan family, who had not been able to have special family time in many years due to the caregiving demands for Jennie, the Comfort and Joy program was able to give the family a weekend get-away with Jennie in Wisconsin. The JourneyCare Foundation raises funds from our friends, supporters and communities to be able to continue making a difference through the Comfort and Joy program and to ensure that our patients and families can focus on what is important during a difficult time. And to make sure that they can make every moment count.